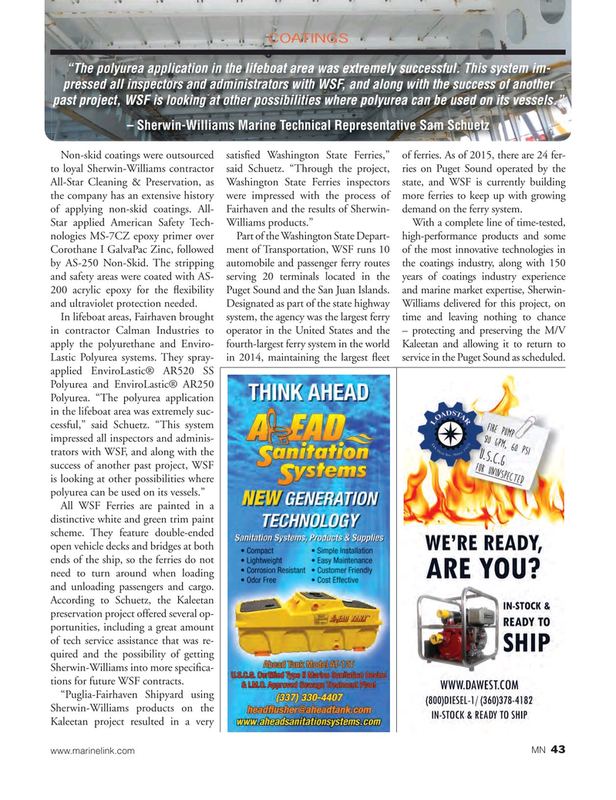 All-Star Cleaning & Preservation, as Washington State Ferries inspectors state, and WSF is currently building the company has an extensive history were impressed with the process of more ferries to keep up with growing of applying non-skid coatings. All- Fairhaven and the results of Sherwin- demand on the ferry system. Lastic Polyurea systems. They spray- in 2014, maintaining the largest ? eet service in the Puget Sound as scheduled. All WSF Ferries are painted in a distinctive white and green trim paint scheme. They feature double-ended open vehicle decks and bridges at both ends of the ship, so the ferries do not need to turn around when loading and unloading passengers and cargo. Sherwin-Williams into more speci? ca- tions for future WSF contracts.